All of us love Pav Bhaji!. Our Bhaji is always full of carbs as in go lots of potatos! I tried a Pav Bhaji with different ingredients in which veggies & proteins are balanced with reduced amount of carbs. It turned out very tasty !!! Here's the recipe. Grated carrot, Red & Yellow pepper for decoration. 1. Mix Black eyed beans, Whole moong & Lentils & soak for 2-3 hours. You can directly pressure cook these by adding 2 cups of water. After cooling grind in mixer or food processor to a coarse paste. 2. Cut cauliflower, broccoli , carrot in cubes. Pressure cook them separately. Mash them or grind in mixer or hand blender. 3. Boil green peas & spinach to soft. 3. Cut green pepper, onoin & tomato into small pieces. 4. Heat 2 tb spoon of oil . 5. Add garlic & ginger paste . Saute for some time and add chopped onion, tomato & green pepper. Mix well & cook till it becomes soft. 6. Add pav bhaji masala & red chili powder & mix well. 7. Add ground lentils , cauliflower, broccoli, smashed potatoes, green peas, spinach & mix well. Add 1/2 cup of water. Cook for 10 mins. 8. Add 1 tb spoon of butter. Smells delicious! 9. Turn off the flame . 10. Sprinkle delicious pav bhaji with chopped coriander and chopped onion(optional). Serve with cheese and lemon slices on the side. Don't forget the butter roasted pav. 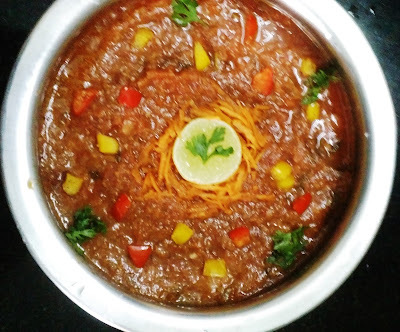 Enjoy this healthy & yummy pav bhaji as much as you want without guilt !! !